Launcher is the original app launching widget -- and still the best! 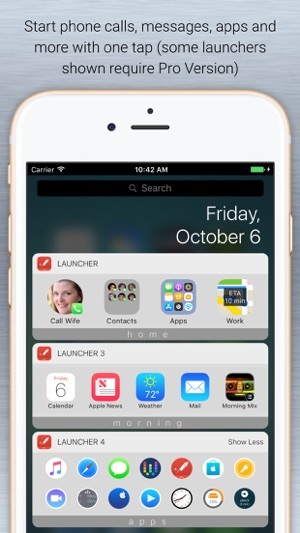 Now with version 3, Launcher has far and away the most powerful widgets on the App Store. 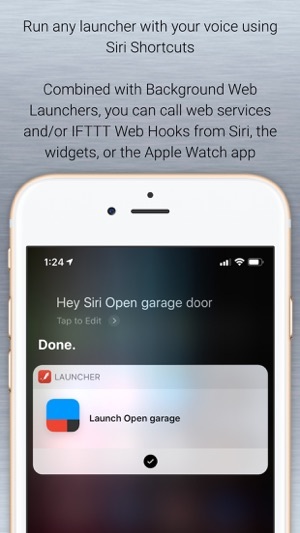 When you install it, you get up to 6 widgets (with in-app purchase) which can be added to Notification Center on your iPhone or iPad so that they're just one swipe away! Top 10 Productivity App in over 80 countries and counting! Why worry about what apps to put in your dock or your home screen when you can put dozens of app, web, music and contact launchers in your Launcher widgets? Unlike the dock or home screen, Notification Center can always be accessed with one swipe even if you're in an app, an app folder or even the lock screen. - Call, message, email, and facetime the people you contact the most. - Get directions home or search for nearby restaurants, coffee shops, or whatever you're looking for at your current location. - Quickly access your favorite web sites. - Perform actions within a number of apps. Run Workflows, load a specific page on Facebook, fire off a canned email or message, tweet, and more. - Start playing your favorite music immediately with music launchers. - Folders. Save space and keep your launchers more organized by grouping them into folders. 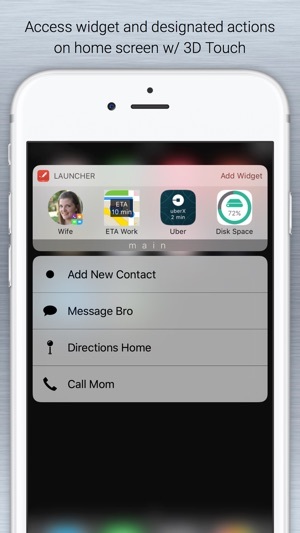 - Launcher for Apple Watch: Initiate calls, messages, map directions and music from your wrist. 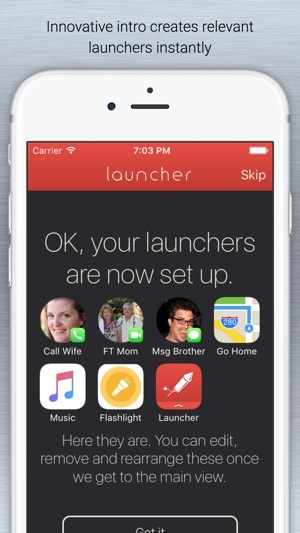 - Launcher triggers: Get a notification to launch an app at set times or locations. - Backup and restore launchers to and from iCloud. 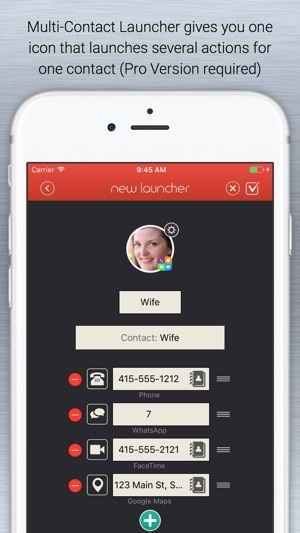 - Innovative auto-setup of launchers which will set up contact launchers for the people most important to you and your most frequently used apps. - Incredibly easy setup and editing of launchers. Just a few taps and you're done. - Ability to create custom launchers for apps and actions that aren't yet supported. - Pro Version users get the ability to change the icon sizes and hide labels to make widget more compact. - Great accessibility for the sight-impaired. - Siri Shortcut support. Run launchers with your voice. 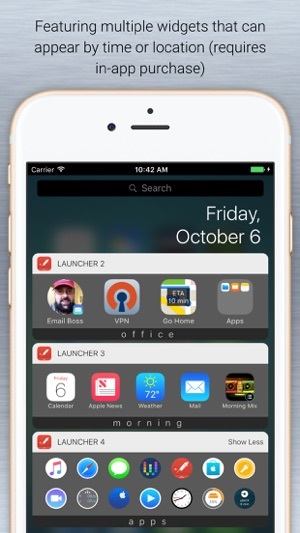 Unlock up to 6 total widgets (with an in-app purchase) for more space for launchers, better organization, and the ability to show or hide widgets based on day, time and/or location. Set up specific widgets for morning, weekends, home, work, the gym, etc. and always have relevant launchers just a swipe away. Multiple widgets not available on iPhone 4S. Upgrade to the Pro Version (with an in-app purchase) to enable more rows of launchers and customize the size of each widget by changing the size of the icons and/or hiding the labels. Please support further development on the app by unlocking Multiple Widgets or the Pro Version today. NOTE: If you don't see an app in your Installed Launchable list when adding a new app launcher, try searching for it instead. This is a new restriction placed on the app by App Review. - Fixed a crash when deleting launchers in watch setup. - Fixed a bug where max watch launchers was limited to 24. - No longer inverts colors of app icons when Smart Invert is enabled. - Added haptic feedback on background web launchers. - Fix for crashes on iOS 9.0-9.2. If you like Launcher, please consider writing a review in the App Store. They really help us out. Thanks! I try a lot of apps. I'll get really excited about an app I saw on the App Store or heard about from a friend or podcast and try it. And I usually use it for a few days or even a few weeks before I lose interest because it only does a couple useful things or I realize it doesn't really do what I need. But Launcher has been my absolute favorite app from the moment I downloaded it a couple years ago. And it continues to add features that make it so much easier to do the most important things I need to do on my phone. With one swipe, I have everything I need just a click away. I can call my husband, get directions home, text my favorite people, go right to a specific web page, turn on/off my lights, Shazam a song I hear on the radio or in a store, or check Facebook instantaneously. I can set up separate launchers for work vs home. I can even set them up based on time of day so I can quickly do the things I need to do when I wake up, go to bed, and all day in between. There have been a couple times when I had trouble adding a launcher, so I contacted the developer, and he was super responsive in adding access to the app I was looking for, and every time there's an update, I find even cooler ways I can shortcut my workflows. It is so rare to find an app that exceeds my expectations. But Launcher does that every day. And it saves me a TON of time, which is invaluable. 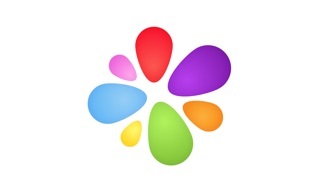 I’ve used this App for several years across multiple iPhones and iPads. As I tried to move widgets across platforms yesterday I was reminded of some shortcomings. I have purchased the app and paid for one upgrade only to be met with a second in app purchase to unlock the functionality I really need. I certainly don’t mind paying for apps (I’ve been doing this since day one of the first iPhone release), but an app like this shouldn’t have a multi tiered purchase in my opinon. This is all the more true as there are now totally free options which provide most of the functionality found here. Also, there are any number of new apps not formally supported by Launcher. This also makes this app less useful to me. Wow! Is all the comes to mind when tried a few years ago. My iPhone broke without a warranty, And could not replace with new one for a year and a half. Decided to reinstall and try out pro version and my Wows! Are tripled at not how much smoother and quick it is, but am amazed at the large number of new and more efficient things you guys have added; especially for the magic launcher for timer. Now if my watch is dead and want to set a timer, I don’t have to double click the home button, find the app The timer is on, then daouble click to go back to my apple nusuc, Facebook, etc., I can just slide down, then left and shows timer; of which is still counting time and showing it counting inside the widget. Amazing! Thank you for saving me lots of time throughout the day, and keeping my accidents on a bike down dramatically cuz of me trying to check msgs or mess with phone more than I should be when riding on-the-go.